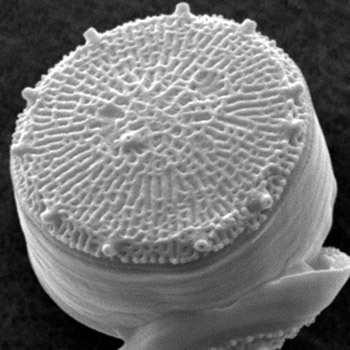 A scanning electron microscope image of the diatom Thalassiosira pseudonana. As reported in this week’s online edition of the Proceedings of the National Academy of Sciences, Scripps graduate student Emily Trentacoste led the development of a method to genetically engineer a key growth component in biofuel production. In the quest to loosen humanity’s dependence on traditional fossil fuel consumption, and with it rising concentrations of carbon dioxide and their damaging impacts on the environment, finding economically viable fuels from biological sources has been elusive. A significant roadblock in algal biofuel research surrounds the production of lipid oils, the fat molecules that store energy that can be produced for fuel. A catch-22 has stymied economically efficient biofuel production because algae mainly produce the desired lipid oils when they are starved for nutrients. Yet if they are limited in nutrients, they don’t grow well. With a robust diet algae grow well, but they produce carbohydrates instead of the desired lipids for fuel. In a significant leap forward that clears the lipid production hurdle, Trentacoste and her colleagues used a data set of genetic expression (called “transcriptomics” in laboratories) to target a specific enzyme inside a group of microscopic algae known as diatoms (Thalassiosira pseudonana). By metabolically engineering a “knock-down” of fat-reducing enzymes called lipases, the researchers were able to increase lipids without compromising growth. The genetically altered strains they developed, the researchers say, could be produced broadly in other species. In addition to Trentacoste, Hildebrand, and Gerwick, coauthors include Roshan Shrestha, Sarah Smith, Corine Gle, and Aaron Hartmann. With a graduate student leading the research and two others contributing, the study underscores the value of a Scripps-UC San Diego education and the leadership role of students in cutting edge research.